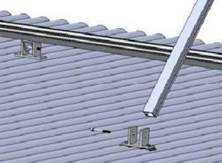 Solar panel tilt mounting frame has adjustable tilt legs that attach to rails clamped to one or more solar panels. These kits are designed for installing solar panels on a tin roof, anchored to a concrete pad or bolted to a wall. 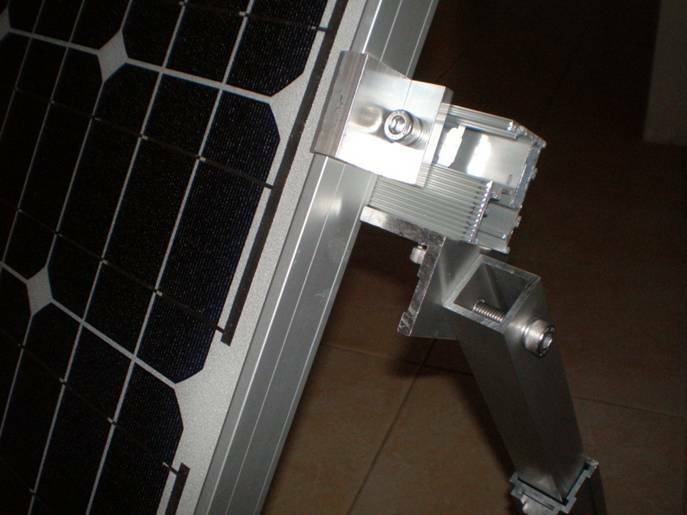 This Solar panel tilt mounting frame has adjustable tilt legs that attach to rails clamped to one or more solar panels. These kits are designed for installing solar panels on a tin roof, anchored to a concrete pad or bolted to a wall. Clamps will suit 35mm frame thickness, please specify 25mm, 32mm, 40mm, 46mm or 50mm clamps for other frame thickness. 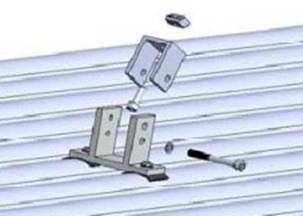 The solar panel (not shown) is held to the rail (shown in cross section) by the clamp. 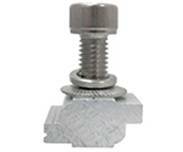 The clamp’s bolt and Z –shaped nut (Z module) are inserted into one channel of the rail. 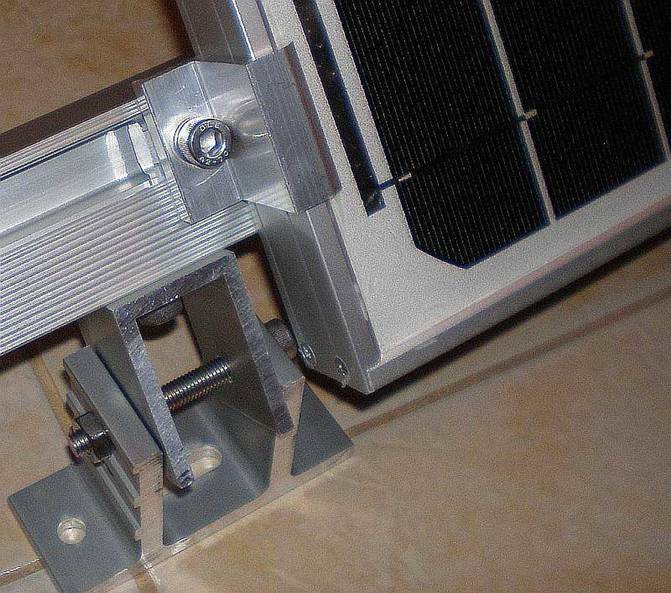 The Z modules of the tilt mount legs and feet are inserted into the other channel of the rail. Position the Z Module loosely in the rail so it can still be freely moved in the rail channel. Slide the screws to their final position and fasten firmly with an allen key (torque is 8 Nm). 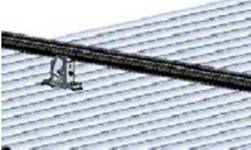 The following diagrams show tilt frames assembly on a tin roof for a row of several solar panels. Determine the positions of the tilt feet according to your plans. Shim the feet with rubber if required. Fix feet to wood rafters using 6 x 65mm wood screws, Use metal fixing screws for sturdy metal surfaces. Mount parts loosely so they can be adjusted in the mounting rails then fasten completely. First attach the U bracket to the rail using the Z module and then bolt it to the foot mount. Attach the back feet to wood or steel rafters. 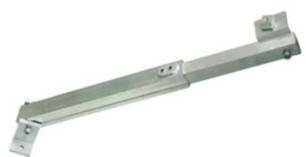 Attach the L Bracket with the Leg to the rail using the Z module. Then attach the legs to the feet The length can be adjusted by loosening the grub-screw with an allen key. 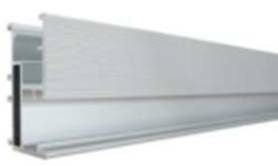 When used to provide power for lighting a solar panel should be facing directly at the sun at midday during mid-winter. 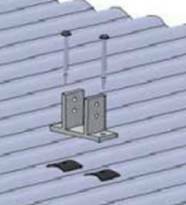 When installing a single solar panel it is best to attach the bracket to the solar panel on the ground. Protect the back of the solar panel during assembly as it easily damaged. Now turn the solar panel over and attach the front legs to the upper rail. Adjust the position of the rails and the lengths of the back legs to get the desired angle of tilt.